Why does geothermal technology cost more than traditional HVAC systems? How long will it take me to pay off any additional cost through lower energy bills? 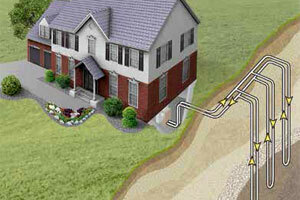 Can I really rely on geothermal alone to heat and cool my home? Whether you’re designing new custom home or need to replace an inefficient or older heating and cooling system, the total cost is always an important consideration. However, initial cost of equipment and installation isn’t always the best way to measure the value of your new home comfort system. How much it costs, year after year, for the energy used by your heating and cooling system should always be included in your calculations. In Texas, from San Antonio and its suburbs to the Houston and Dallas Ft. Worth metro area, many residential developers and homeowners are excited to learn that today’s revolutionary geothermal HVAC systems are highly efficient and can cut energy bills drastically. Texas homeowners can save almost a third of the cost of a new geothermal heating and air conditioning system through a federal income tax credit for 30% of the total cost of that new system and its installation. There’s no limit on how much you can save, but there is a tight deadline. To qualify, the ground source heat pump equipment must be installed and in service by December 31, 2016. After that, the tax credit disappears unless it is renewed by Congress. Don’t miss your opportunity for this tax credit. Call your local Texas AC Company today. Most of the higher price quote for geothermal home comfort systems is due to this factor. Since ground source heat pumps utilize the constant temperatures deep underground on your property to transfer heat to and from your home, closed loops of special tubing are buried deeply in the ground. That requires excavations and placement of those loops. Whether the installation is horizontal or in deep, well-like holes, excavation or well drilling, along with possible landscaping costs, make geothermal heat pumps more expensive than traditional residential HVAC systems. Larger homes require more powerful heating and cooling systems, and ground source heat pumps with higher capacities naturally cost more to manufacture. In addition, the larger your home is, the more extensive the heat transfer ground loops must be. How well insulated your home is also plays a role in what capacity, measured in tons, you need. Your contractor will evaluate all of these factors and make careful calculations to accurately size a system for your home. Your price quote will reflect those considerations, as it would for any type of system. The actual mechanical equipment for your new system will cost more than a traditional gas furnace and central AC unit, but not substantially more. Much of the cost will also depend on the manufacturer and model of equipment you select. There are several popular brands available in Texas, including ClimateMaster, Carrier, Trane, GeoComfort and WaterFurnace. The exact equipment you need will also depend on your home’s existing heating and cooling methods. Installation costs for the systems are also comparable for these systems. Expect your Texas AC and heating company to give you accurate price estimates for a range of options. Compare these, along with warranties, reliability and operating cost estimates before making a final decision. One of the chief benefits of going geothermal with your home heating and AC system is much greater efficiency and lower monthly energy bills. Each home and system is different, and so are the potential savings. In Texas, homeowners typically save from 30-80% on their overall energy bills with a ground source heat pump system. For most Texas homes, geothermal HVAC systems can easily handle all heating and cooling requirements, and even hot water heating, if you select that option. You’ll realize major savings on electric bills, as well as savings on natural gas or propane. Ask your contractor to help you calculate these savings and give you an estimate of how soon the savings will cover the additional cost of your new system. 3-5 years is typical. After that, your savings are like a pay raise. Look at the numbers and make the choice that is best for you. Today’s ground source heat pumps are becoming a popular home comfort choice for both new and existing homes throughout Texas, from Hondo, Tarpley and Adkins to Seguin, Helotes and Pipe Creek in the San Antonio metro, from Hankamer, Hillcrest and Splendora to Montgomery, Pearland and Katy in the greater Houston area, and from Lucas, Duncanville and Plano to Hutchins, Mansfield and Haltom City in the Dallas Ft. Worth area. Once homeowners and real estate developers learn how much they can save and how this advanced technology increases the value of a home, the decision is simple. Texas is ideal geothermal country. You owe it to yourself to get the facts and compare price quotes for all systems that are ideal for your home before making a final decision. We recommend contacting a full-service HVAC contractor near you and asking for a free consultation and price quote on a full range of options for your new heating and air conditioning system. Consider all system types and compare long-term costs and savings. The Texas AC companies in the directory on this website will be glad to assist you.